Every day we work to help our residents live the best lives possible, and while we’re always grateful for the opportunity to work with these incredible people, once a year there’s a week in which we get to really celebrate our jobs. This year that week is starting on September 9thand going through September 15th. It’s the 23rdannual National Assisted Living Week, which was established by the National Center for Assisted Living (NCAL) to provide opportunities for residents, their friends and family, staff, and volunteers to recognize the role assisted living plays in caring for older Americans and those with Alzheimer’s or some form of dementia. Each year, National Assisted Living Week has a theme and this year’s theme is “Capture the Moment.” The theme has a few goals, including inspiring residents to seize the day and realize their dreams, while also encouraging staff and volunteers to think of the short moments and small interactions with residents as the ones that really define their care. 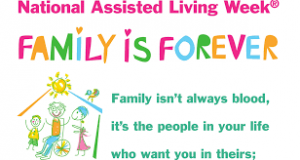 Finally, this theme will hopefully help the country at large to realize that, contrary to popular belief, those living in assisted living have not yet reached the end of the line. While the wordplay in the title of this year’s theme intentionally evokes thoughts of photography and videography, it’s not just about capturing today’s moments. It’s also about providing an opportunity for residents to look back over their lives at the things they’ve seen and done and experienced, as well as the people they’ve known. Photos and videos can be a great way to help residents accomplish this, especially those with degenerative diseases who might not be able to remember some of the most significant moments in their lives. Arm everyone with a camera: residents, visitors, and staff. You can either use disposable cameras and then take them in to get the film developed, or you can use polaroid cameras so everyone can see the results immediately. It’s best to stick to physical cameras, rather than smart phones, since many older people don’t know how to use smart phones properly and could get confused. But everyone knows how to use a physical camera and polaroids give the added pleasure of watching the picture come to life before your eyes. On the other hand, disposable cameras are just as easy to use, cost effective, and the delay in getting to see the photos provides extra joy as everyone gets to see photos they don’t even remember taking – or they do remember, but the picture didn’t turn out quite like they thought it would. You can think outside the box when it comes to “capture the moment” and capture it with pencil and paper instead of a camera. This might be difficult for some of the older residents, but it could be fun for the more artistically inclined staff and visitors to draw residents and share the results. Scrapbooking is a great way to reminisce. It gives residents a chance to think about their lives as a story as they organize their scrapbooks by grouping photos together. They’re also creative and just a fun way to spend time. We’ve just scratched the surface of the possibilities here. Don’t be afraid to dig a little deeper into your creative well and think up fun ways for you and your residents/loved ones to celebrate National Assisted Living Week. Here at Stillwater Senior Living, we treat our residents like family. Our apartments include studio, one bedroom, and two bedroom suites. They are designed with security features, maximum accessibility, and include walk-out patois with a full range of amenities for the entire family. CONTACT US today for more information and a tour of our beautiful state-of-the-art community.